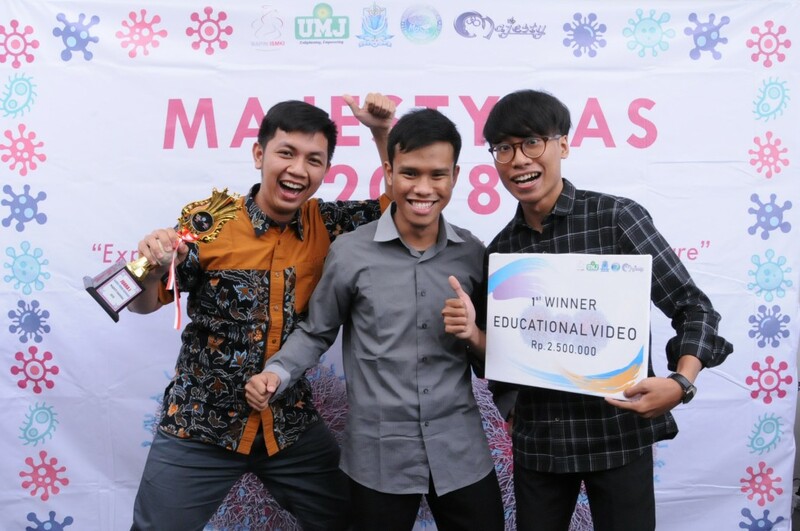 Alfian Novanda Yosanti, Naufal Abdurrahman, and Dodi Faras Ilmiawan Sutomo took a photo with the First Place trophy of Educational Video Competition in MAJESTY 2018. JAKARTA (Ath-Thib) – Faculty of Medicine’s students of Universitas Islam Indonesia (FM UII) kept engraving the scientific achievements on the national level. On the event of Muhammadiyah Jakarta Scientific Competition (MAJESTY) 2018 which took place on July 26 – 28, 2018 at the Faculty of Medicine and Health, Muhammadiyah University of Jakarta (FMH UMJ), the FM UII delegation consisting of Naufal Abdurrahman, Alfian Novanda Yosanti and Dodi Faras Ilmiawan Sutomo succeeded in winning the 1st place in Educational Video Competition. MAJESTY 2018 is a scientific event held for students of health and medicine groups throughout Indonesia. The activity was organized by Muhammadiyah Medical Researcher Community (M2RC) FKK UMJ. This year, MAJESTY presented the theme “Expanding the Possibilities of Women’s Health Care” and this event was attended by 101 participants divided into 37 finalist teams from 21 universities throughout Indonesia. MAJESTY 2018 organized five branches of competition, namely: Scientific Writing, Scientific Poster, Public Poster, Scientific Essay and Educational Video. The finalists competing in Jakarta were the participants who had passed the first stage of the selection, where only five to seven teams were selected as finalists for each competition branch. The participants presented their work in front of the jury and also answered the questions given to them. The competition among the finalists was very tight because they came from various well-known FMs in Indonesia, such as University of Indonesia, Gadjah Mada University, and many more. On this occasion, the FM UII team created an educational video about early detection of cervical cancer. This was motivated by the fact that the number of cases and deaths from cervical cancer in the world and Indonesia was increasing. About that, it is needed an educational media which is interesting, educational, and it can influence the community, especially Indonesian women, to care about the dangers of cervical cancer.